If you are thinking of cutting back on sugar, you first need to define what that means. Is it just avoiding sugary desserts after your meal, or does it extend all the way to the natural sugars in fruit and sugars added to bread? 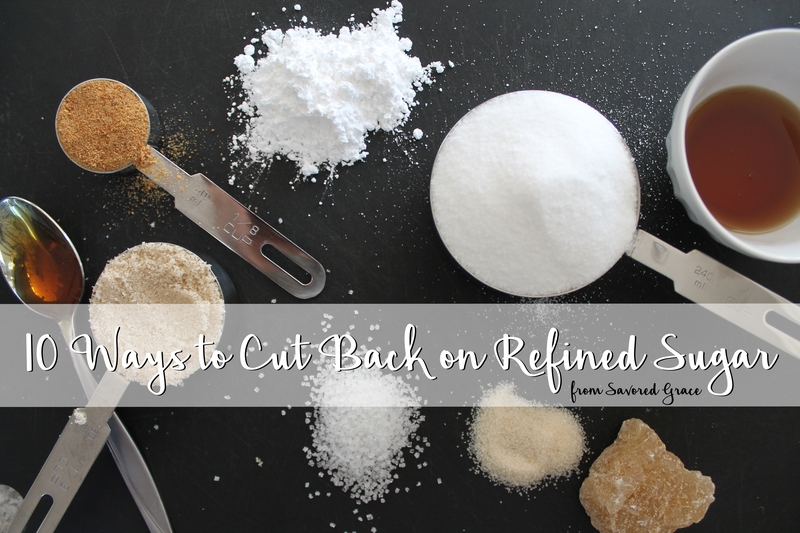 My personal cut-off line was firmly anchored in the word “refined.” I wanted to avoid sugars that didn’t add any nutrients to my body, which meant white sugar, brown sugar, raw sugar, and all of the chemical and alternative sweeteners/extracts such as agave (which, news flash, is actually worse for your liver than white sugar), stevia, splenda, and monkfruit (which may contain antioxidants, but also may increase insulin secretion, and generally hasn’t been studied thoroughly as a sweetener). While I am concerned about the calories I intake, that wasn’t my primary reason for giving up sugar: my reason was that I have a hard time eating only one treat instead of ten, and that I desired to increase the amount of vitamins and minerals I was eating. Hence, for me, I do still eat small amounts of pure maple syrup (which naturally contains manganese and zinc) as well as raw honey (which is actually very rich in minerals and amino acids, as well as potentially boosting the immune system). I also bake with coconut sugar occasionally, which I probably can’t justify, except that it has a low GI value and is much less refined than white or brown sugar. So sue me, I’m not a purely logical creature. I don’t eat much fruit because I don’t like it, but I am also very game to include any sugars naturally found in whole foods in my diet. This means that I make desserts out of sweet potatoes and dates these days. My sugar boundaries may or may not make sense to you, but here’s what I want you to take away from my explanation: you should set limits that you can actually work with. I knew when I gave up sugar that most of the popular diet and lifestyle regimes (whole30, paleo, keto, even South Beach) were much too restrictive for me. I can never obey rules that seem arbitrary or too rigid. I wanted to do something healthy for myself, but there had to be room to breathe! Figure out where you need your breathing room to be; this will make it much easier to succeed when you cut back on sugars! Here are 10 things that I did, and still do, to help me avoid refined sugars. Plan AHEAD. The two things I found really hard to eat after I gave up sugar and highly processed foods were breakfast and snacks. Breakfast is a hard meal without sugar because most of the quick options are really high in sweeteners. While I, personally, wasn’t avoiding all bread, I also didn’t want to start every day with just carbs, because part of my plan was to gain nutrients. If you don’t eat breakfast, you will probably feel awful. 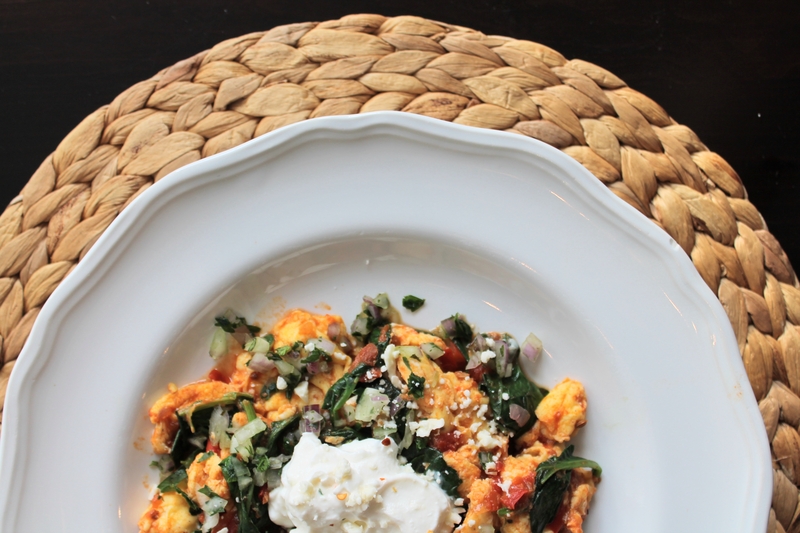 But if you haven’t planned ahead to eat something you will enjoy that is also low in sugar (such as salsa scrambled eggs with spinach or other veg! a giant egg casserole you can reheat day by day! plain toast with natural peanut butter and a bowl full of fruit), then breakfast might seem impossible when you wake up and stick your head into the pantry. Embrace eating fats. Fats are good for you. When you first cut back sugar, you will likely crave it and also feel more hungry than usual. I like to trick my body by giving it fats, which are also mentally and physically satisfying, and can keep you fuller longer than plain veg or lean protein. Fats are flavor carriers, which means you can enjoy the food you eat, even though it is lacking some of the sugars your tongue is used to. I eat half an avocado almost every day…yum. I also eat cheese, hummus, lots of peanut butter. I switched entirely to full-fat dairy, because it helped replace some of the calories I lacked from sugars (which, in my case, was a pretty sharp drop-off at the beginning) with something that felt decadent in my mouth. Fats make a really good snack, and often are available in quickie forms (e.g., to replace crackers, granola bars, etc., that you might be trying to avoid on a sugar cleanse). Prepare yourself to read labels. If you are cutting back on sugar but not cutting it out entirely, then determine ahead of time how much sugar is acceptable in ratio to the total calories, or what kinds of sugar are okay (e.g., I eat honey and maple syrup sparingly; you might decide that 5g sugar per 400cals is acceptable…but keep in mind that even doctors recommend less than 25g added sugar per day—it can really add up fast). For me, I decided that if sugar or a form of sugar was one of the first three ingredients listed on a label, then I would not eat that food. Switch to unsweetened (not “sugar-free”). 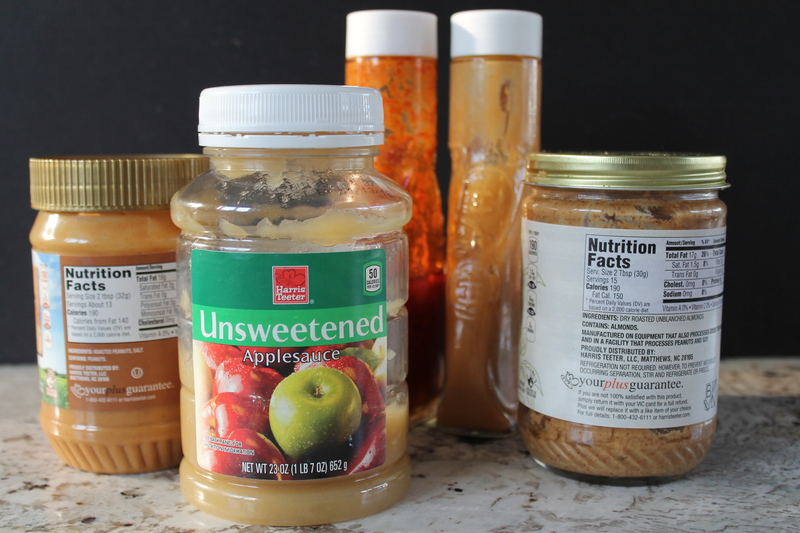 Unsweetened applesauce, unsweetened drinks, unsweetened peanut butter…if there is an unsweetened option, grab it, because it will save you more sugar grams/calories than you think! As you cut back on sugar, initially the taste differences might be shocking, but before long, they will become easier to bear, and you might find you prefer them. Here again, fats can help you (for example, if you normally drink black coffee with two teaspoons of sugar, try instead unsweetened coffee with a tablespoon of half-and-half; more total calories, but the flavor won’t be as bitter). Make your own. Most store-made or processed foods are high in sugar. 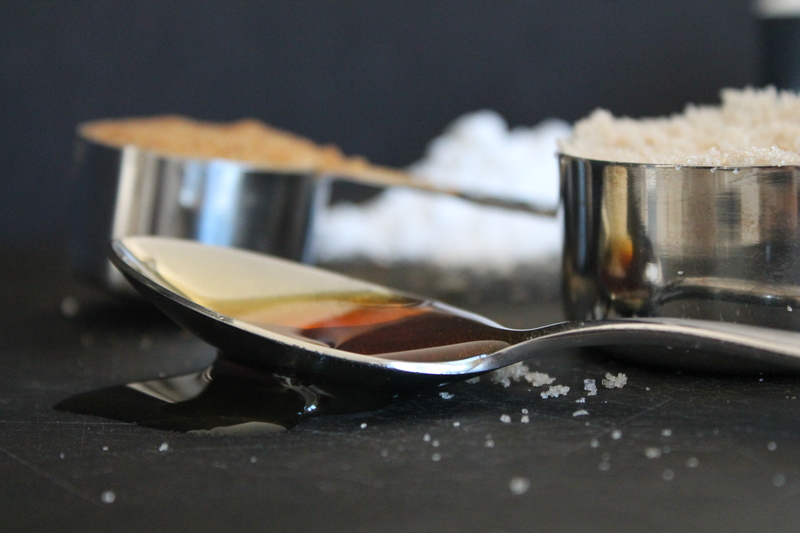 While they are quick and easy, if you are looking for a simple way to cut back on refined sugar, you may want to invest the time in making your own versions of salad dressings, pancake mixes, granolas, cooked cereals, pasta sauces, etc. 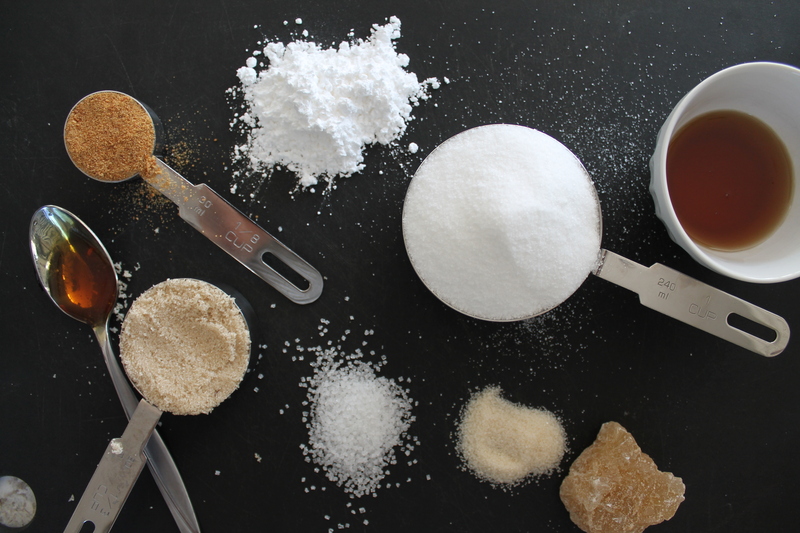 Making your own takes time, but it allows you to control how much and what types of sugar go into those items. I typically make large batches of pasta sauce, tangy vinaigrettes, and granolas to keep on hand, that way I will have them when I want them, and I will know what went into them! When you are going to a dinner or a party, BYO! Bring your own treat or a side dish or whatever will help you know that there is something available for you, and something to look forward to, if the main fare there will be higher in sugar or not very rich in nutrients. Give yourself a treat. 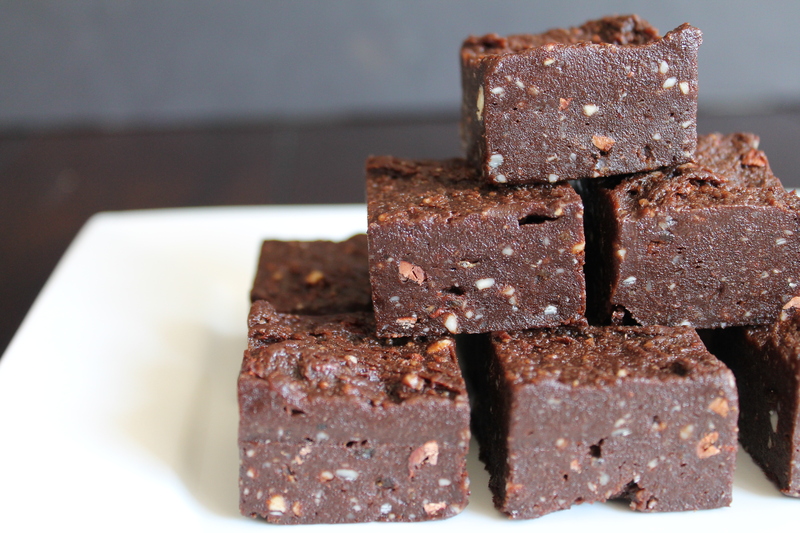 When I first gave up refined sugar, I knew I couldn’t go without dessert for the rest of my life, or even the rest of the week, and I ate a raw brownie every day. It really hit the spot. Some days I would give myself a glass of red wine instead of dessert, and that was also a great treat. If you are struggling with eating nutrient-dense foods (meaning that you know you should, but you really just want to eat cheesy bread for every meal), knowing you do have a treat to look forward to can also help you stay on track with your meal choices! When I first gave up refined sugar, I looked forward to my treats like WHOAH. I still love my treats (today I made myself avocado chocolate mousse and I am still in hog heaven 2 hours later). And if the sweets are full of healthy things, then you can feel good about eating one. The list above is mostly practical steps you may need to take in order to follow through with your goal of cutting back on sugar. But there may also be an emotional side to consider! Like it or not, eating produces emotional results because our bodies are not only physical, but also spiritual. Find non-food treats. Even better than enjoying a healthy dessert is actually figuring out how to treat yourself without food. When your focus is on what you think you can’t or shouldn’t have all the time, then you will feel overwhelmed and frustrated, like you are missing out. Instead, when you think that you deserve a brownie because everyone else is having one, or just find yourself standing in front of the open refrigerator, ask yourself: am I Bored, Emotional, Exhausted, or Famished? (You may have noticed that those words spell out BEEF. I don’t eat beef, but ain’t nothing wrong with a helpful acronym.) If I’m not actually hungry, then I needed to ask myself: what other way I can treat myself or relax? This was a really hard transition for me, because I have always thought of food as the best kind of treat. It is quick and visceral, the solution to every problem from “What should I do?” to “I feel everything,” and, hello, I have to eat anyway, right? It was hard for me to imagine another cheap, easy way to get the kind of boost in joy, the physical pleasure, that eating brought me. So I mainly looked for other things I could do that would bring an immediate, often physical result. These days when I need to relax or treat myself, I often take the time to do my nails, which feels rather decadent and doesn’t require me to spend a lot of money. Other ideas for a small treat include taking a nap (hey, what could be a better treat than rest? Plus, naps help when you know your willpower is getting low with food), watching a movie or reading a book, going for a walk (or your favorite form of exercise), buying some flowers, lighting a scented candle, washing your face or taking a bath, spending intimate time with your spouse. Yes, some of those probably sound like things you should do every day anyway, but distracting yourself from foods you wish to avoid often does look like taking care of yourself in other ways! I have learned to view washing my face as a treat I give myself, because it makes me feel good to have clean skin and to know I took 5 minutes to be good to myself. What is your non-food treat? Ask yourself what you are gaining. This is kind of like “knowing your why,” but with a positive spin. 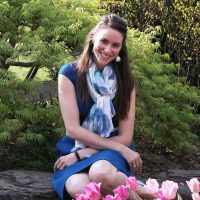 My husband often remarked when I first became a vegetarian many years ago, that he felt like I had only cut something out, and he wondered what I was gaining to replace it, or what positive thing I could feel confident about eating when I knew I couldn’t have meat. Years later, when I gave up refined sugar, I thought about this and it clicked: instead of only losing something, I should focus on what I am gaining. Here’s what I gained when I gave up refined sugar: greens at almost every meal (including breakfast), lots of fats, lots of water and ginger tea, the security of boundaries/knowing I had an easy reason to say no to certain foods, and pride (in contrast to the shame I had felt about always eating way more than my body could handle). And, I’m not going to lie, losing weight as my eating habits changed did feel like a gain. You may notice that some of my list items were physical things to eat, things I wanted to focus on including in my diet instead of lamenting the loss of sugar, and some of those things were emotional results. Thinking about what I gained really improved my self-talk and my motivation during the early weeks without refined sugar! Most importantly, give yourself grace. A sugar fast is a hard thing to do. 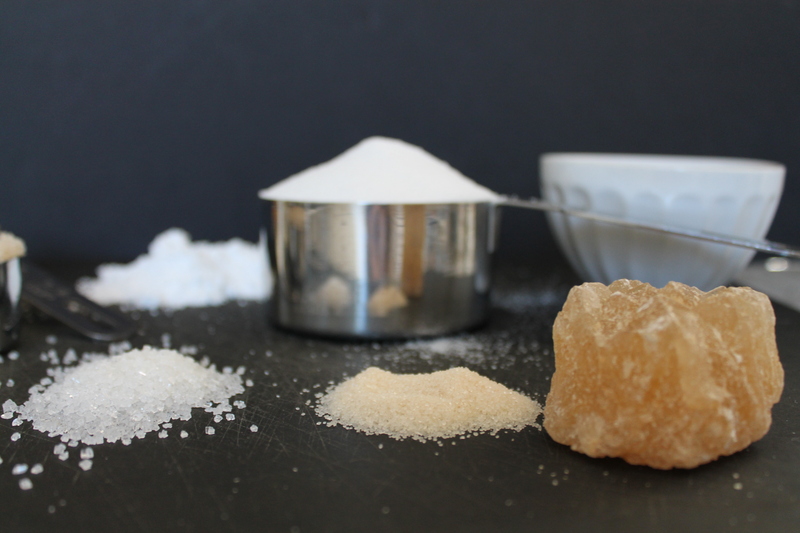 Sugar is everywhere, and we (in the U.S., anyway) live in a culture that says you should be able to have everything you want, and that more food for less money is always better. But hear me, YOU CAN DO IT! But if you take a break for a meal, at a birthday party, or because you forgot, no one will jump out of the shadows and shame you. So don’t shame yourself either! Your next choice can always be one that you feel good about, because you are not merely the sum of your past experiences. Remember, sugar isn’t actually evil; it’s just a food. Refined sugar might not be beneficial to your body, but neither is berating yourself for a mistake or shortcoming. Be good to yourself, no matter what, whether that means taking a break from refined sugar or deciding that it’s worth it to share a slice of birthday cake or have a meal free from questions about ingredients. The verse I want to leave you with is one I cherish, because it reminds me that God is the One who satisfies. I may have surrendered my right to eat refined sugar whenever I want, but really, it isn’t about that. I am blessed by something even more delicious and healthy than anything I could eat or not eat. Instead of seeking satisfaction for my tongue, I can seek soul satisfaction in the Lord.